A recipe calls for 8oz of broth so you buy a 32oz container because that’s pretty much the only size it comes in. Fast forward to a few weeks later and you’re dumping that extra chicken, beef or veggie stock down the drain because it didn’t get used before it expired. Well, these simple recipes will ensure you don’t let that extra broth go to waste and help you get dinner on the table in no time. Have you ever heard of baking brussels sprouts in cream, broth and mustard? Well now you have and it’s a combination you have to try. You can even make this recipe vegetarian by subbing in vegetable broth. This is the best way to eat brussels sprouts in my opinion and this dish has become a regular rotation in our home. I even made it over the holidays for my parents and some of their friends and it was one of the dishes that kept calling for seconds.. The perfect side dish for a cold night, these brussels sprouts are packed with flavor and are crazy satisfying.. Speaking of recipes that have made their way into our routine, THIS. I’ve made it so many times — the fluffy biscuits and flavorful, creamy filling make this a must-have menu item during the colder months. A meal in and of itself. I had to include a soup option because let’s be honest, soup is the #1 easiest way to use up that extra broth. And how delicious does this look? Crunchy tortilla strips, a hint of lime, cotija cheese and a colorful broth. This is a must-make soup for any time of year. Because who doesn’t love a good tortilla soup. Not to mention she walks you through how to make your own tortilla strips. If you’re finding this article helpful, Pin away! Well the Instant Pot is a great method for making risotto more attainable as a menu item on heavy rotation in your house. And if you follow this tip from Bon Appetit, it’s sure to be decadent, filling and delicious. Risotto is even easier with the instant pot! These green beans call for a splash of broth for that little bit at the bottom that you don’t have the heart to throw away. And this method cooks the green beans perfectly- still a bit crunchy and squeaky, just like they’re meant to be. This is always a hit when I’m hosting and I can’t count the number of people who have requested this recipe after trying it. These recipes will help you get back on track after the holidays, or any time of year. A mix of vegetarian and meat-options means there is something for everyone. These tried and true recipes will add to any holiday get together over the Thanksgiving & Christmas. The plight of the home gardner during a productive tomato season is not knowing what to do with them all. These 6 recipes are sure fire ways to use fresh tomatoes to their full potential. 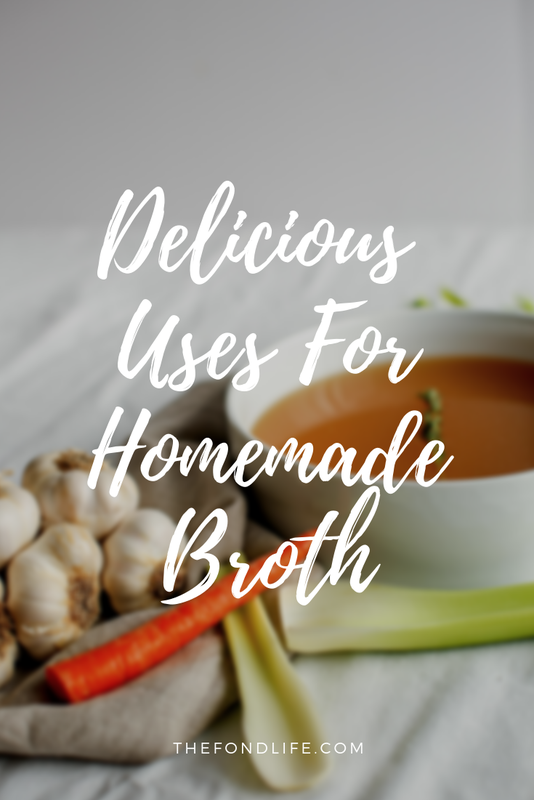 Do you have a recipe that uses broth that I need to try? Let me know in the comments!